WHAT HAPPENS the first time your child rejects food is the key to what happens next. This child is not actually Kaylee, but an unpicky model representing her. Maybe they were anticipating picky eating. That they seemed pleasantly surprised when their child wasn’t picky led me to think that they assumed it was normal for kids to become picky. Maybe they don’t know how it comes about, or that it can be prevented. Now things had indeed gone wrong, as they expected. Well, I suspected where they might have gone wrong. I didn’t take that as an invitation to tell them about it, however, though I am the Mom Whose Kids Eat Absolutely Everything. I said nothing. But that afternoon, I decided to observe my responses, as well as the children’s actions at the table. Instead of following my intuitions unconsciously, I would notice what I was or wasn’t doing in response to these very young (age 18 months and two-and-a-half) budding picky eaters. You see, I was often asked, when my children were young, “How do you get your kids to eat that?” At first, I didn’t know the answer to that question. I used to only wonder what people could be doing that would create a situation where kids wouldn’t eat what was set before them. I couldn’t imagine how kids became picky eaters. I used to assume that I was doing the only things that could be done in feeding kids. I would sometimes say, “If they’re hungry, and that’s all there is to eat, they eat it.” Which is basically still my answer, but the answer is not that simple, as I’ve found out. 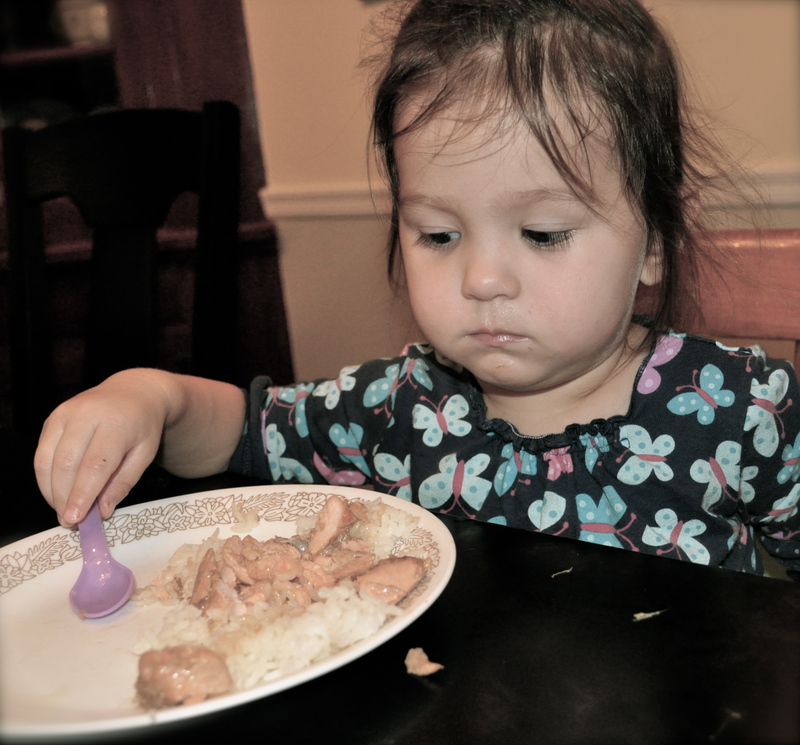 Picky eating wasn’t part of my personal experience growing up or in my early parenting years. Asking how I got my kids to eat things was about like being asked how one figured out how to make a room look good, or how one managed to get along with one’s in-laws, or why one’s kids had become hoodlums. One doesn’t always know such answers right off. You just do things, or it “just happens.” Sometimes a lot of unconscious behavior and assumptions, and following what you’ve seen modeled, has gone into some of our abilities or disabilities. We do what seems obvious and right to us. We often don’t know how to do otherwise. But sometimes the answers can be discovered, a cause-and-effect discerned. I’ve since observed enough counter-productive parenting around food to know what can go wrong. I watched and have noticed what parents of picky eaters do that I would never do. How would I, the Mom Whose Kids Eat Absolutely Everything, react to these budding picky eaters? I have been blessed, through no merit of my own, with the gift of a set of skills and assumptions that produce kids who eat absolutely anything. What are the mechanics of my success? What exactly am I doing that works? How do my actions different from those of parents whose kids dive deep into pickiness? Where do things go wrong? When I brought out the pizza, sure enough, Kaylee began to pick off and set aside on her plate the little slips of yellow pepper. Both kids began to stick their little fingers suspiciously into the blobs of goat cheese on the pizza. I was a little annoyed, but I didn’t show it. I also noticed both kids seemed to treat pizza as a kind of dinner plate, from which to remove things and either eat or set aside. They are toddlers, so I saw this as a learning opportunity, to teach them how to eat correctly. Now is not the moment to tell Kaylee to eat her yellow peppers, or to show displeasure, or tell her “No applesauce afterwards” if she doesn’t eat everything. It’s time to avoid any such reaction at all, and stay off the track of battling over what a child puts in her mouth. The trick here is not to make her eat, but to make her want to eat. Making her eat will never make her want to eat. I instructed both toddlers that the way we eat pizza is to pick it up and put everything together in your mouth. I guided their tiny fingers away from picking and prodding the food. This is how it’s good, and how it’s supposed to be eaten. That’s how we eat it. That’s what big people do. I very calmly assisted a couple of bites with each child, to demonstrate and prime the pump, let them get a try of how much better it all is taken together. Each eagerly opened up for the incoming bites of pizza. The new concept seemed to interest them and gave them something better to think about than refusing to eat yellow peppers or worrying about goat cheese. As the grown-up, I didn’t dignify the yellow peppers incident by taking notice of it. I was cheerful, confident, and friendly. I would casually try again as I saw them forgetting that you eat pizza in complete bites, not separate items. I didn’t insist or force or get mad about it. I remained pleasant, and talked about other things or sang little songs or joked around with them in between these assisted bites. What they ate they ate, what they didn’t want, I said nothing about. It’s annoying and silly and wasteful and we don’t like it when kids pick at their food. It makes a mess. We can also start worrying that our little darlings won’t get the nutrients they need or that they will become more and more picky, and will not only drive us crazy but also fail to thrive. However, if you express dismay, attempt to make them eat something or even encourage them to put anything at all in their mouth, you give them power over you that they shouldn’t have. You gratify them for their attempts at being picky and getting your goat. Their picky eating experiment is bound to continue at that point. You can teach them about food: how to eat, as with the pizza, or what’s interesting, where foods originate, what they smell and taste like, how they’re made, or what they help or harm us. We can and should also teach them how to behave: manners or skills in eating, like how to use silverware, or ways to be nice at the table. If Kaylee had thrown the pieces of yellow pepper on the floor or at her brother, I would have expressed disapproval. I would have told her what she should do instead. I would have enforced the rule. Kids need help with skills and knowledge and to be instructed in good behavior. Small kids don’t much care about if it’s good for them or if it costs money or if it’s a mess. They do care what goes in their mouth, and just like anybody. Like anybody, they don’t like being forced or controlled about something so intimately their own. What goes in their mouth has got to be up to them. If you attempt to force eating in any way, the child will find a way to win. Next: “How to Prevent Picky Eating from Ever Starting, Part II“: In which the little brother spits out his red peppers, and what The Mom Whose Kids Eat Absolutely Everything does about it.